Pettson & Findus have sniffed the circus air and just can not get enough of it. The many clowns, jugglers and acrobats have them both really impressed. So they decide to build their own circus. 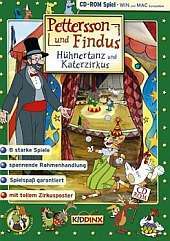 Findus has a name already: chicken dance and cat circus. Gustavsson gets wind of it and laughing at their project, he makes fun of them. With the help of the Pettson & Findus, users can build their circus and prove what a great circus performers they are!